With equity indexes closing the week on a negative note, the VIX opened higher.. and battled hard to hold onto moderate gains, settling +7.2% @ 13.78 (intra high 14.02). 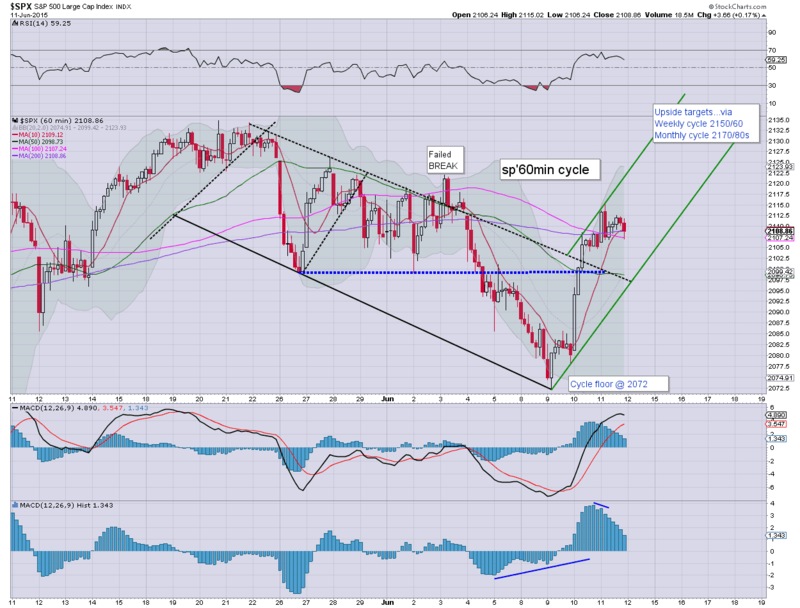 Near term outlook is uncertain, with the threat of the sp'2072 low being taken out. 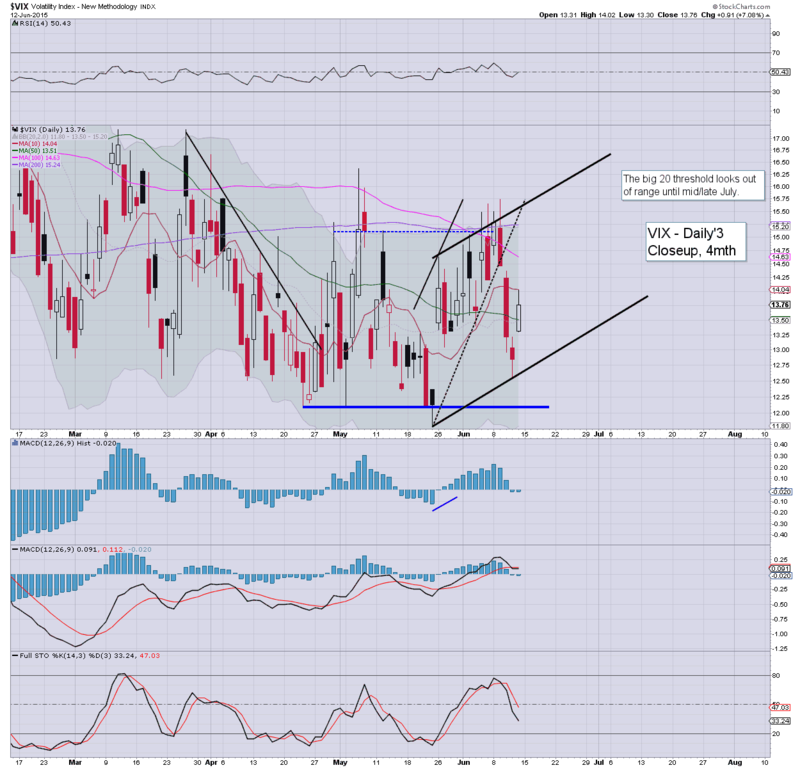 Suffice to say, despite equity weakness into the weekend, the VIX remains broadly subdued, stuck in the low teens. Considering the persistent 'Greek issue', it remains an incredibly complacent market. The big VIX 20 threshold looks out of range in the immediate term. At best... if the market is further upset next week, the 17/19 zone looks 'briefly viable'. US equities closed broadly weak, sp -14pts @ 2094 (intra low 2091). The two leaders - Trans/R2K, settled -0.4% and -0.3% respectively. Near term outlook is uncertain into next week, with some stocks (such as INTC) suggestive of weakness across next week. *closing hour was mostly choppy, price structure on the smaller 5/15min cycles is a bearish flag... and is certainly suggestive of downside follow through at the Monday open. ... and another week comes to close. 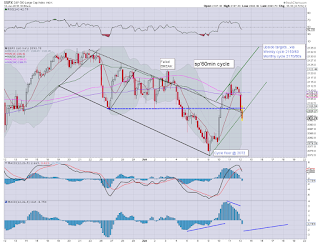 Certainly, I am surprised at the renewed weakness today, so much a net weekly gain! The sp'2072 low is looking vulnerable early next week.. if that fails.. a test of the rising 200dma in the 2050s will be due. 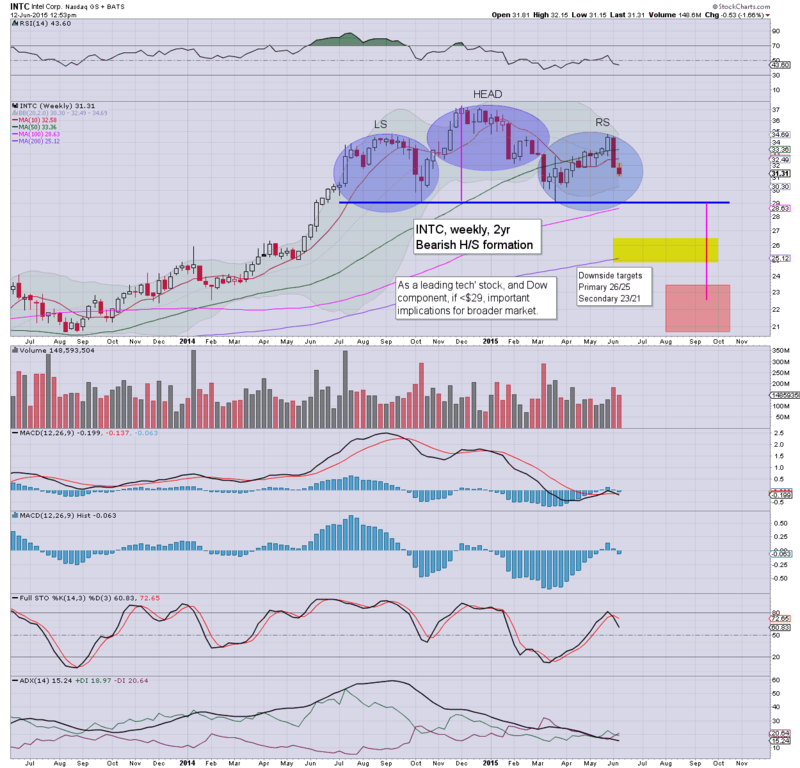 Amongst everything I watch... INTC is the most bearish signal I am seeing. US equities remain moderately weak, sp -16pts @ 2092, with VIX +7.8% @ 13.7%. USD is back to flat @ DXY 95.00. Metals are in minor chop mode, Gold u/c, with Silver -0.7%. 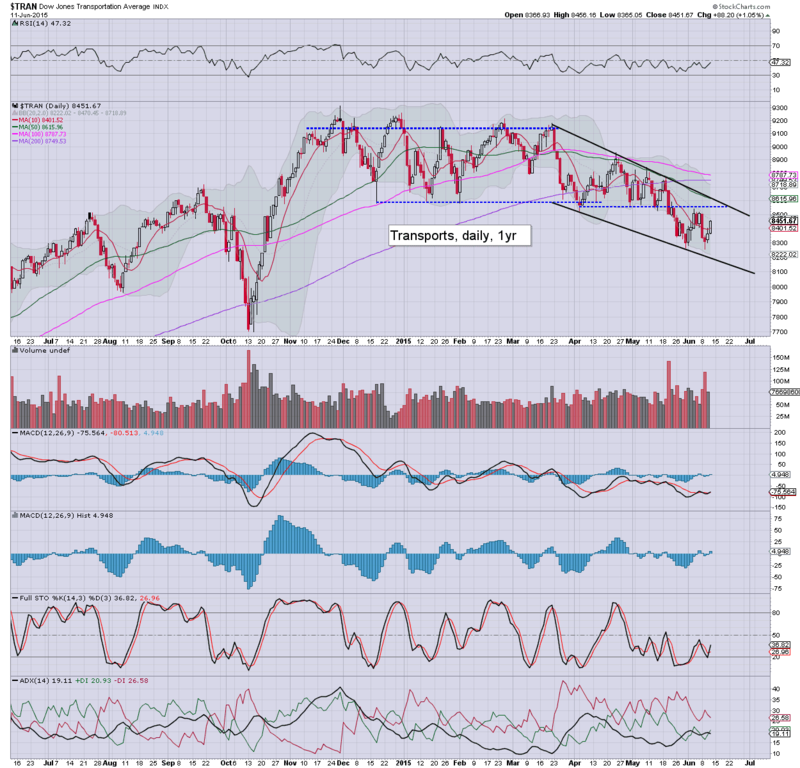 Most indexes look set to close with moderate net weekly declines. Well, we're set to close lower... the only issue is whether an extra wave lower in the closing hour... which does seem probable.. with sp'2080s and VIX 14s. 3.35pm... notable strength: airlines, DAL/UAL, both higher by 1.0%.... no doubt the lower oil prices are helping. 3.51pm.. price structure is a micro bear flag on the 5/15min cycles.... the setup is BEARISH for the Monday open. US equities remain moderately weak, and there appear too few willing to buy back above the sp'2100 threshold. Price structure is a micro bearish pennant.. offering renewed weakness into the weekly close. 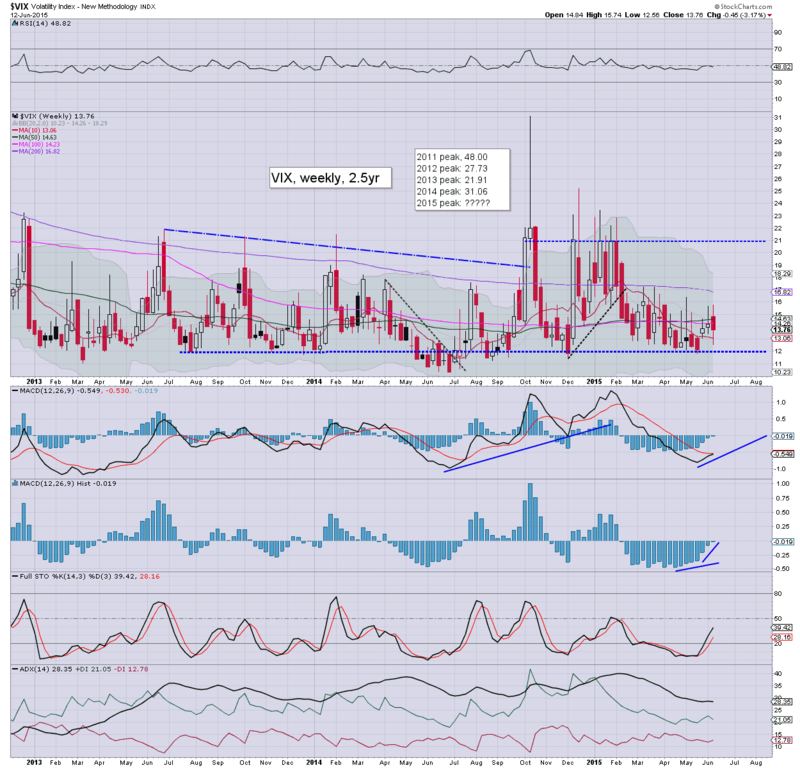 VIX is reflecting moderate market concern, +6% in the 13.60s. Suffice to say... market remains weak.. and it looks like we're increasingly set for a closing hour of 'rats selling into the weekend'. 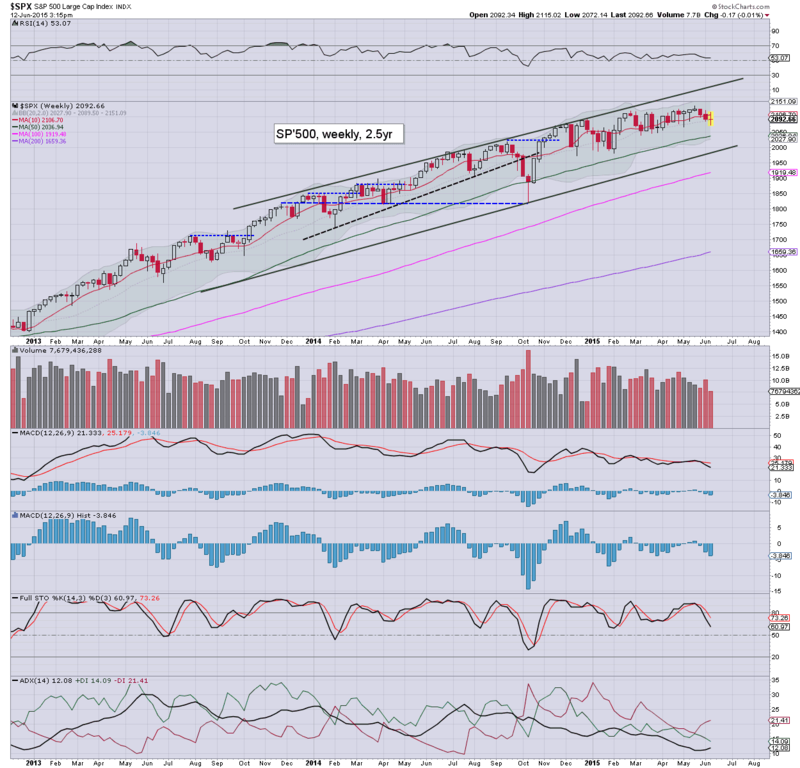 If so... moderate net weekly declines.. in the sp'2080s.. with VIX 14s. oil/gas drillers, RIG/SDRL, both lower by -2.5%, daily charts not looking so pretty. 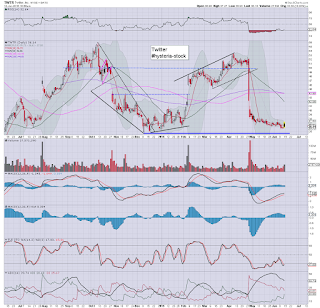 .. even TWTR is net lower by -0.3%... ugly daily candle. 1pm update - INTC warning of trouble? Whilst the broader market is only moderately lower, Intel (INTC) remains a real problem for those equity bull maniacs (myself included?) 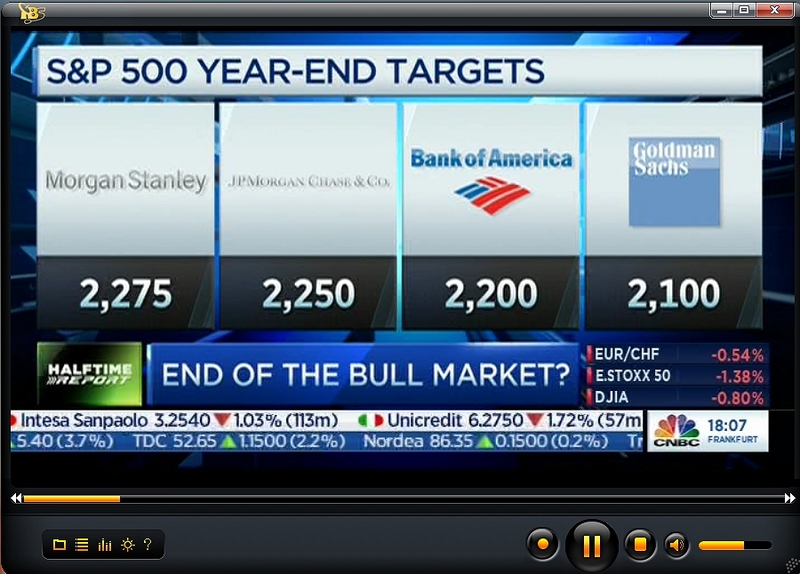 who are seeking new highs in the near term. Current price structure is a rather clear bear flag.. with viable downside to the low $29s... all within a much grander H/S formation. 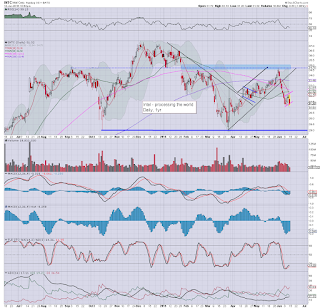 I have been increasingly watching INTC across the last few days... and we now have a smaller scale bear flag.. that is arguably already being confirmed with today's sig' decline. 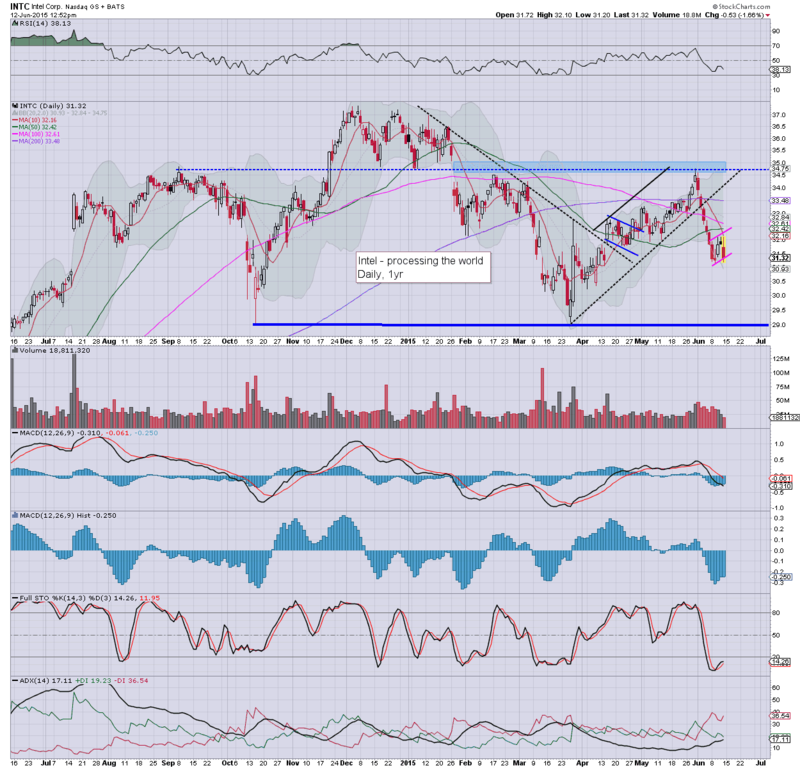 Is INTC an appropriate stock to extrapolate to the broader market? I guess some could argue about that for hours... but I think it is a very important issue. Mainstream consensus remains pretty tight in the 2200s Such a yearly close won't be easy if we're trading around 2000/1900s in Sept/Oct. US equities remain moderately weak, with a morning low of sp'2091, with VIX 14.02. With sporadic Greek headlines, the USD has turned lower, -0.2% in the DXY 94.80s. Metals remain moderately choppy, Gold -$1. Oil remains weak, -1.2%.. having lost the $60 threshold. 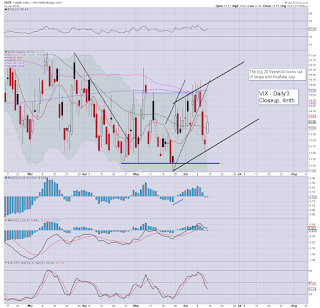 The VIX gap zone of 14.25/50 remains a tempting target...... would be suggestive of renewed weakness into the weekly close. 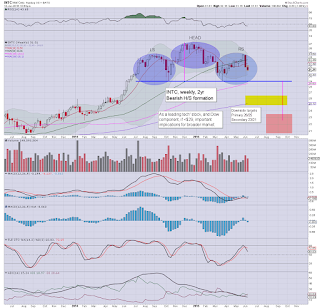 notable weakness, INTC, -1.7%... I'll try to cover it in the next hour or two... as it is one of the strongest indirect signals that the bulls will NOT be able to rally in the near term. See recent 'fair value' post for more.. as it could be a leading warning of trouble for the broader market later this summer. 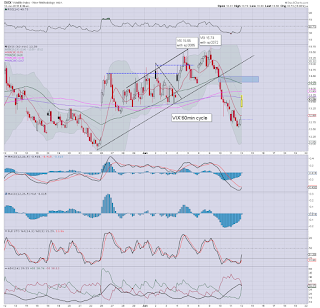 coal miners, BTU -4.8%... with stronger declines in ACI, ANR, WLT.. the trio of horror. *seemingly.. another no show today. Interesting morning for the bears, but overall... how many times has the market seen morning weakness like this... and we remember how it usually ends, yes? VIX continues to reflect a market that simply has near zero concern of anything, not even a possible end month Greek debt default and/or exit from the Euro. 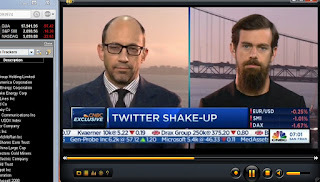 notable strength: TWTR +1.1%.. but still.. that is a lousy outcome after yesterday AH gains. The daily black-fail candle sums up the messy situation. 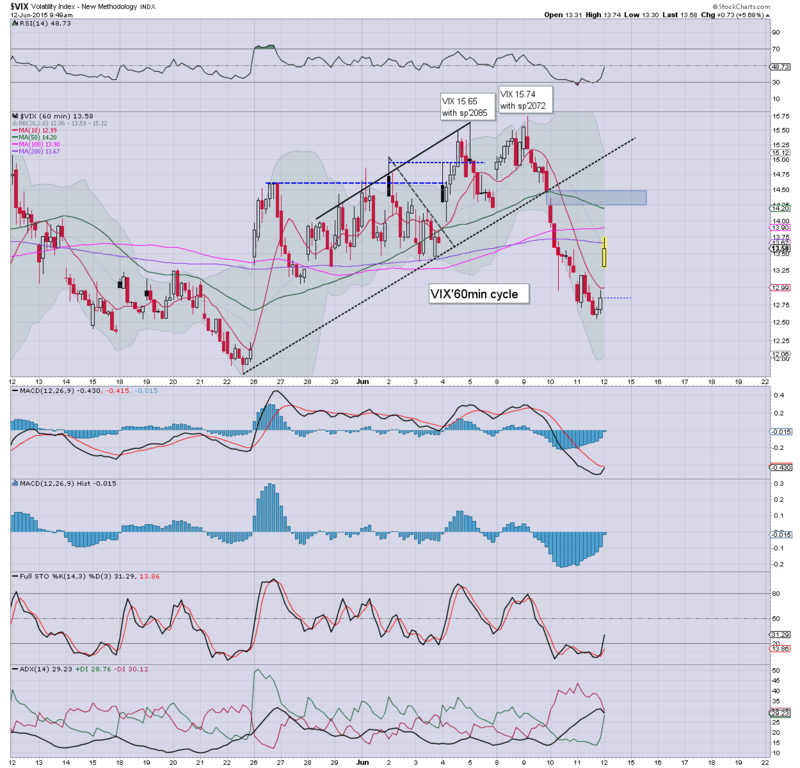 weakness, oil/gas drillers, RIG -2.5%, SDRL -1.7%... as WTIC oil prices struggle, stuck within the $56/62 range. *those seeking the sp'2140s and upward.. are going to need to see WTIC break into the $63s, the next set of inventory reports had better be another be major net draw downs. 11.15am... notable weakening in the USD, -0.3%..... having swung from early gains of +0.4%. Another 2-3 weeks lower in the USD...not long to wait until a viable mid term floor in the DXY 92/90 zone. 11.30am.. a minor up wave to sp'2099... with VIX rapidly cooling. It remains somewhat messy, but who wants to be short ahead of Yellen next Wednesday? 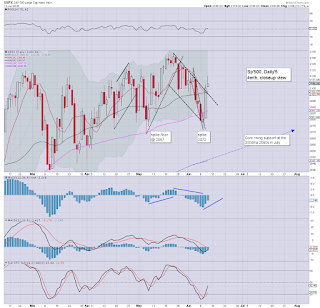 US equities open moderately lower, with the sp'500 testing the lower rising trend support around sp'2095. 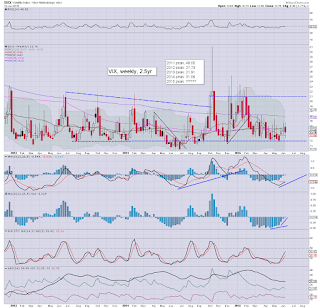 VIX remains relatively subdued, +6% in the 13.60s. 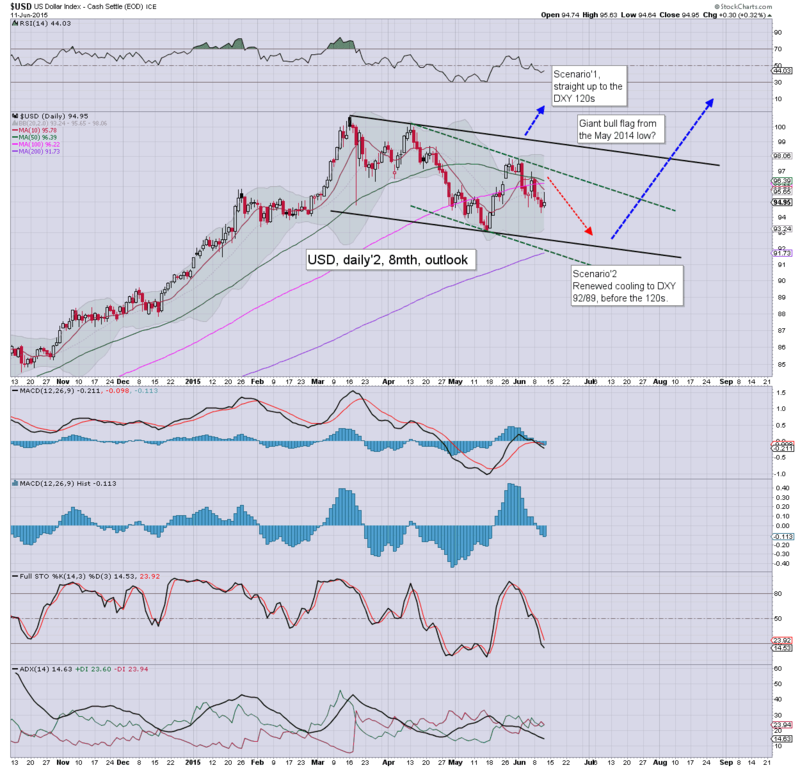 USD +0.2% in the DXY 95.20s.. but looks vulnerable to a net daily decline. Metals have turned marginally positive, and look set for a sig' net weekly gain. *there is a minor price gap in the VIX at 14.25/50, but that is out of range unless sp'2080s.. and frankly.. that looks unlikely. So, we're a little lower, but as is almost always the case.. the opening declines are nothing significant. 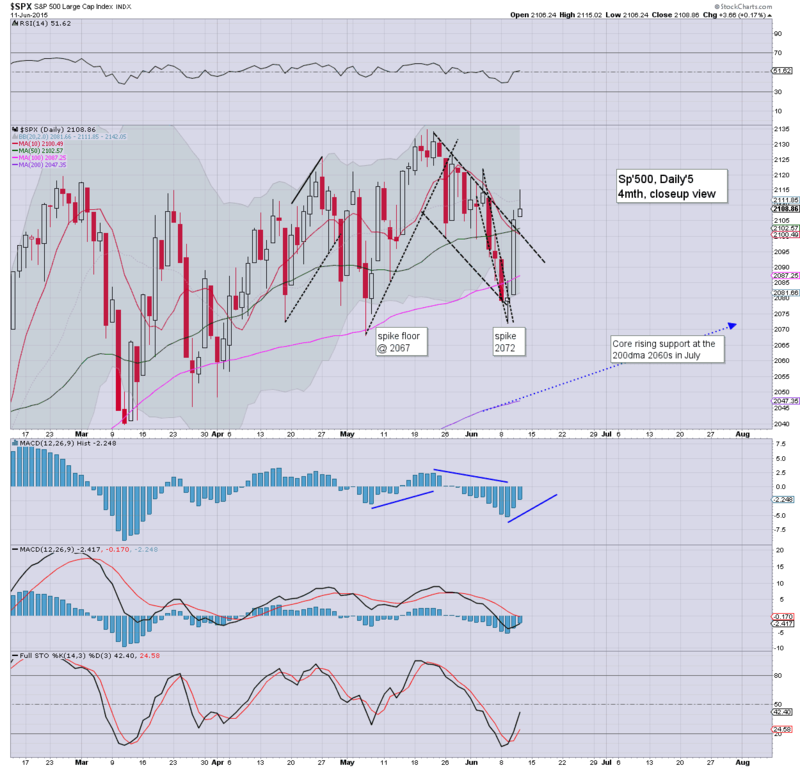 Equity bears continue to face the usual problems, and all things considered.. the low of day is probably already in. 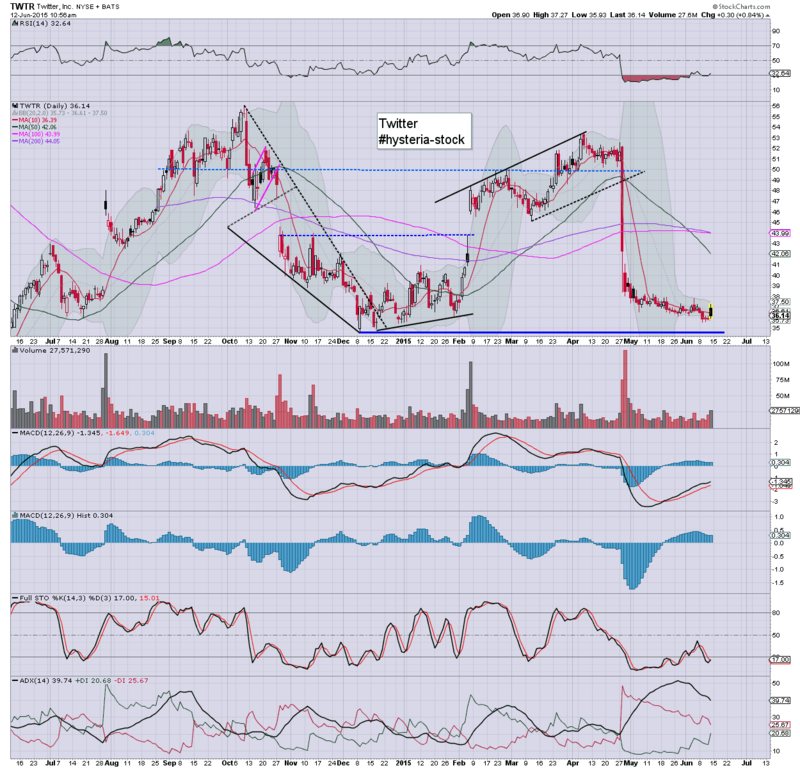 notable strength: TWTR +2%... certainly not getting the major jump that many were expecting last evening. Daily candle has already turned into a black-fail.... what a mess! Both look so very happy that its almost the weekend. 10.06am... sp'2101.. with VIX cooling.... looks like we do indeed have a retrace low of sp'2095. 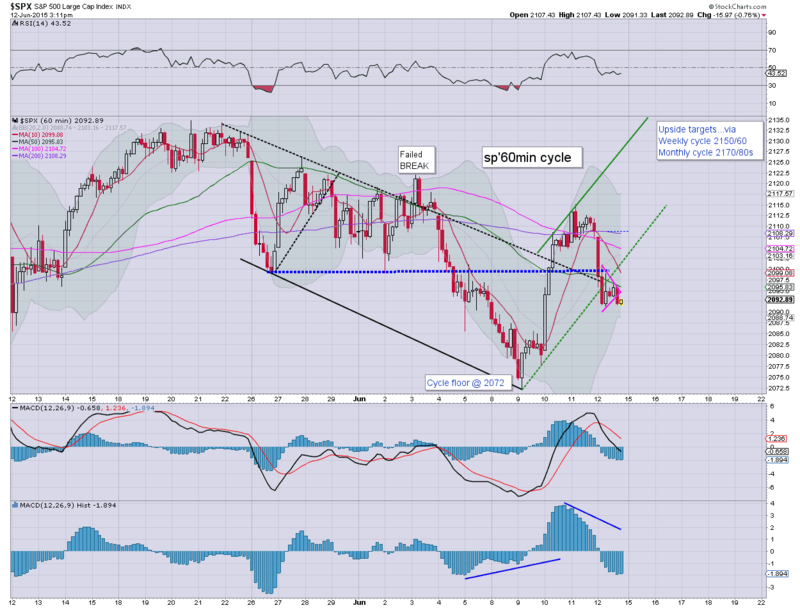 Hourly, daily, weekly, monthly cycle, will all be offering the 2150s on a spike high at next Wed' FOMC. 10.27am.. Well, TWTR close to turning red, on rather huge vol' of 24 million. Maybe they need the interim CEO to quit too ? Broader market still holding the earlier low... just. VIX just not showing any sig' upside power. Whats the excuse, Greek concerns? So, we're set to test first key support at the sp'2100 threshold. 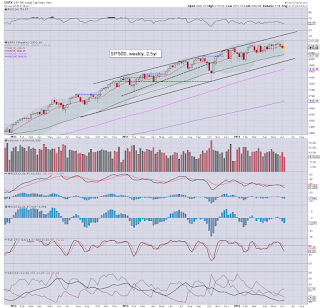 All things considered, regardless of some morning weakness, a weekly close in the 2100s looks probable. notable early strength: TWTR +3%... on the 'good news' that the CEO has quit. 9.33am... Eyes on the VIX.... there is a little gap zone of 14.25/50..... that would seem to be the very best bears can hope for today. Whilst equities continued to climb, the USD saw some chop, settling +0.3% @ DXY 94.95, but that was considerably below the morning high of 95.63. The near term trend remains bearish, with the 92/90 zone on track into early July. 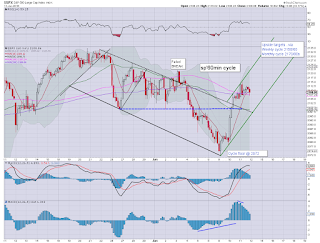 The 120s remain a grander target into 2016. 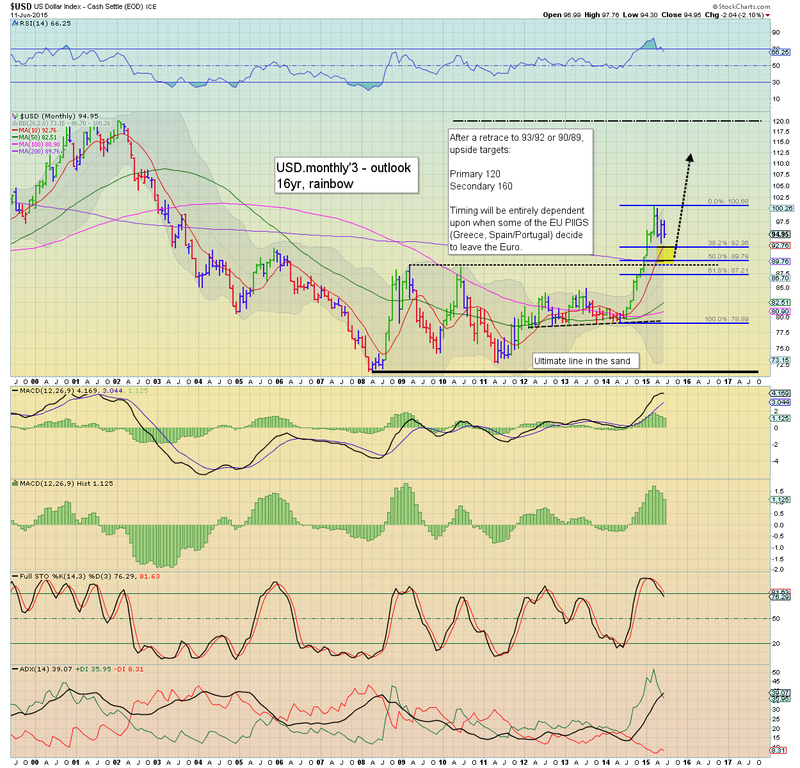 I remain of the view that the USD will be a very important variable in the months... and years ahead. This should especially be the case in terms of the precious metals, oil, and to a lesser extent, equities. 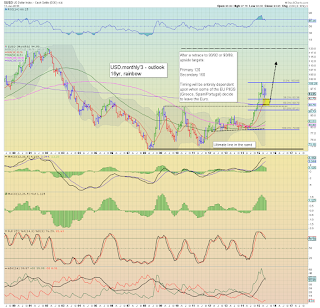 Eventually, the USD looks set to take out the March high of 100.71.. and then proceed on a hyper ramp to the 120s. A move from the low 90s to the 120s would indeed be a rather severe move, but then... so was the move from the 77s (May 2014) to the giant 100 threshold. Regardless of the ongoing 'Greek issue', the Euro looks set to weaken all the way into late 2016. 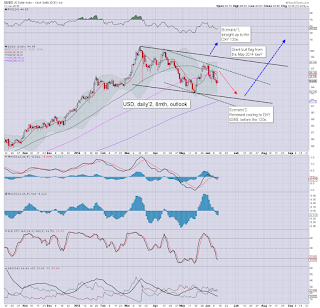 Parity against the USD certainly won't be a key long term floor. The 0.80s look a relatively easy target, given a year or two. Rather than the traditional 'dollar doomer' viewpoint that we'll all be shopping at the local grocery store with Gold or Silver coins, I am of the opinion that the US Dollar will remain King of FIAT land for some years to come. This seems a rather obvious outcome, as the ECB and BoJ are printing their currencies into semi-oblivion*. The USD is of course just one variable that will have an effect on the US capital markets, but to me, its at least one of the top three! *yes, I realise the amount of paper/digital currency in existence is a small fraction of overall wealth, but still, QE is a hugely important issue. 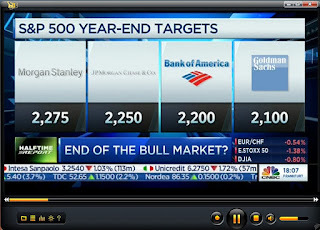 Broadly, it was a 'reasonable' day for the equity bulls, with the sp'2100 threshold now solidifying as short term support. 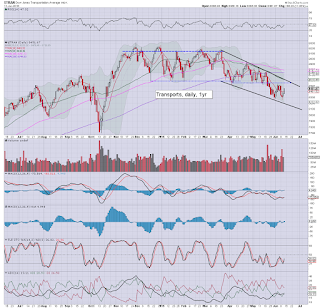 A move to new historic highs in 'some' indexes looks viable before end month. Clearly though... the 'Greek issue' remains a wild card, with a set of payments due end month. If the Greeks default... things will get real interesting... real fast.